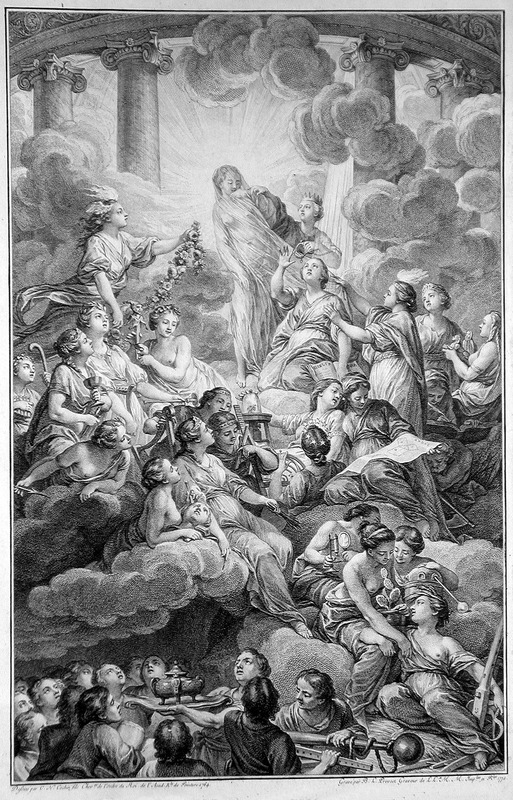 Frontispiece from the massive 18th Century Enlightenment compendium Encyclopedie, chiefly edited by Diderot. Astoundingly, this depiction--so richly suggestive of movement and sensual human contact--shows a crowned male figure representing "Reason" pulling a thin veil off the naked female figure representing "Truth." It is difficult to avoid considering this print as an ideological depiction, claiming to reveal what had been the hidden--but true--cosmological order, in which deliberative male Reason asserts the right to decide or rule, by pulling the veil off of sacred female Truth, sensual yet passive, satisfied to playfully toy with nature and the technical instruments for its inspection (science) and representation (art). Although this may have been intended as sly satire, one thing is for sure: reason and truth are ideas that evoke intense emotions, and thus, they are logically metonymically linked to desire. The Enlightenment was--and to an extent, still is--at least as much about (male) desire as it was about rationality. Where do we derive our reasons, rationalizations, and explanations from? How do we discover, define, and decide to adopt new concepts? Logical reasoning is part and parcel of our actions and thoughts, in everyday practice, throughout our lives. The problem with human logic is that the very symbolic systems we use to represent our logical arguments inevitably allow us to represent absurd or contradictory arguments, too. Even from the beginning, in learning to use a logical system of representation, we have to get over the fact we’re also learning arbitrary choices of symbols that are set by convention, to refer to certain concepts. So we all too easily forget that when we were young, there was a time–as late as six or seven for many of us (and we still turned out ok)–that “2 + 2 = 4” was gobbledigook nonsense. Logic can lead us into confusion, even before our more complex thoughts really get going. When we think about logic, we tend to focus on how one can rationally draw conclusions from premises. So we make deductive arguments. In our minds. Orally. Through various literate media: writing, print, electronic. We do so in order to explain our environment, justify courses of action, establish reassurances that the world has some predictable order in it. We tell ourselves and others that certain conditions have necessary implications that we need to expect and be prepared for. We use inductive logic, too. Perhaps even more often. We have an experience, make an observation about how two phenomena relate … or perhaps how something has changed over time, and we generalize our understanding of why the change occurred. Why phenomenon A implied phenomenon B. We build the relationship between A and B into a general concept. Hopefully, it’s needless to say that logical thought and communication can aid effective behavior. We have to navigate intricately interrelated social, material, and ecological environments. Some logic is usually better than none. Other things being equal, an animal that can use logic to organize information and guide its course of action will have greater chances for survival and reproductive success than another population member who is only capable of random, unpredictable irrationality. From a biocultural perspective, then, logical arguments are not just interesting for philosophers, mathematicians, and computer programmers. The capacity to make logical arguments has long been evolving in nature–in the form of embodied cognitive representations. More to the point, the cognitive capacity for logical decision-making has been shaped by natural selection–in a wide range of animals, at least in many birds and mammals–as an adaptation for learning and effective behavioral decision-making in complex, unpredictable environments. 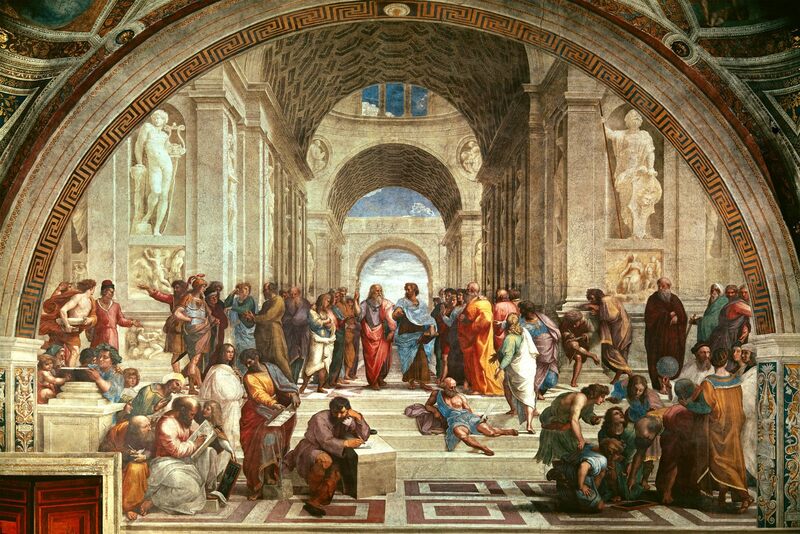 The School of Athens (fresco by Raphael, 1510-11). Public domain image from wikipaintings.org. Anyone who’s taken time to ponder why–why are states of affairs the way they are, why did they come to be, why do we wonder about what they will become?–realizes that this is hardly a simple problem. To know a thing is to know its cause; and the Causes, each of which may be used as a middle term in demonstration, are (1) The substantial or Formal cause; (2) The necessary conditions of a thing, or Material cause; (3) That which gave the first impulse to a thing, or Efficient cause; (4) That for the sake of which a thing is done, or Final cause. In the coming couple of weeks, I will be presenting a series of posts on the fundamental, yet very complicated, relationship between Anthropology and Philosophy. The relationship between these two disciplines–one with quite a young intellectual and political history and the other quite ancient–is important. It’s important in part because Anthropology has good reason to depend on Philosophy. It is Philosophy that has established key premises about knowing ourselves and the world. And especially in cultural anthropology and anthropological archaeology, we grapple with major themes of 19th and 20th century philosophical inquiry: meaning, the nature of power and agency in society, and the materiality of being. At the same time, Anthropology’s influence on Philosophy has been fitful but occasionally significant. This is especially the case where the ethnographic documentation of cultural and linguistic diversity has informed arguments about symbolic communication, ethical judgment, and behaviors as embodied practices. The interdisciplinary relationship is complex and sometimes difficult, though. Anthropological observation and analysis has historically needed philosophy more than the other way around. And as the later 20th Century was a period of academic disciplinary specialization–often cascading into fragmentation–much research and writing in these respective disciplines tackled virtually the same phenomena, labeling them with different terms. In short, the later 20th Century intellectual fragmentation that has occurred within Anthropology has also made tenuous and haphazard those connections between Anthropology and Philosophy. And with a deep interest and abiding hope for a “biocultural synthesis” within Anthropology–a consensus-seeking point of departure that views ethnological approaches to symbolic structures, practice, and power as complementary with multi-scalar models of change in biological systems–I suggest that we could benefit from an honest and careful consideration of what each discipline has–and continues–to offer the other. Such a consideration can illuminate new, more effective and relevant ways of inquiring and understanding ourselves and the world. The next post will deal with general problems and approaches to causality: why do things exist, happen, change … why do we care … and assuming there’s a compelling case for caring about “why questions,” how do we go about defining and answering interesting ones? This post is important, in part because it draws Classical philosophical concepts and arguments from the beginning. How should we consider Aristotle’s discussions of cause, form, chance, necessity, and system? I will compare Aristotle’s quite static or equilibrium paradigm for why things and events are and occur with the more dynamic, fluid view of modern systems approaches, informed as they are not only by mathematics, but also by interdisciplinary inquiry, from biology to economics and physics. This approach underscores key modern scientific insights into complex systems that often show unpredictable, often stochastically behaving patterns over time. 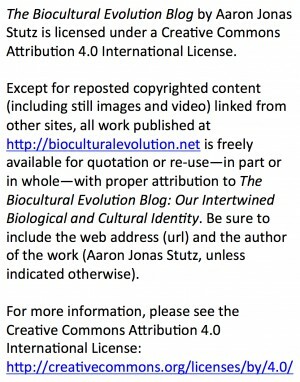 In turn, the dynamic systems conceptual foundation allows us to look very critically at approaches to causality in biological anthropology as well as cultural anthropology and archaeology. The non-nested hierarchical dynamic system constitutes a profoundly powerful conceptual tool for analysis, comparison, and explanation of what seem to be incommensurate observational frameworks and phenomena that have hindered biocultural synthesis in Anthropology for decades. Please do not hesitate to e-mail me with thoughts or questions about this broad but important topic.